Livermore Village aerial view. Image courtesy Opticos Design. Livermore Village Green. Image courtesy Opticos Design. Livermore Village is a pioneering infill project that will serve as a model for downtown revitalization of a small California city. The entire project design and entitlement process was a joint effort of Opticos Design and Thomas Dolan Architecture. Opticos led the site planning, urban design, and character development, and worked with TDA the entire time to develop the building types, unit plans and landscape design. 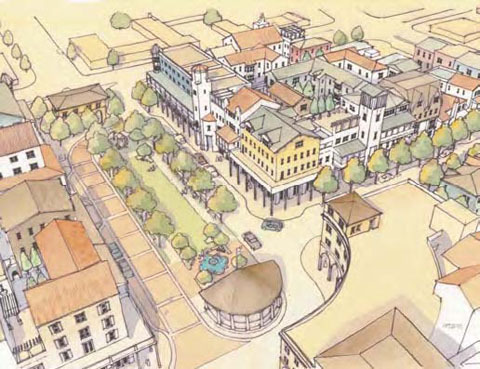 Traversed by two re-opened streets that cross at a central green and serve to reconnect the finer grained street grid of the downtown, Livermore Village includes five multistory podium-style buildings with live-work liner flexhouses facing the green. The liner units are designed to flex into retail at a later time, and they also surround and shield the internal parking kernel, which is equipped with the Parklift system. Atop the podium are three levels of courtyard housing, most of whose units are accessed directly or via stairs from the landscaped courtyard level. Rooftop gardens afford panoramic views of the city, the Livermore Valley and the hills beyond. Rounding out the 281 units of housing at Livermore Village will be several townhouse and townhouse-over-flat building types, as well as stand-alone live-work townhouses. One of the podium buildings is designated as affordable live-work for artists; it includes shared studio and gallery space at the ground level. The design team worked closely with the local arts community to craft the form and use of that building. 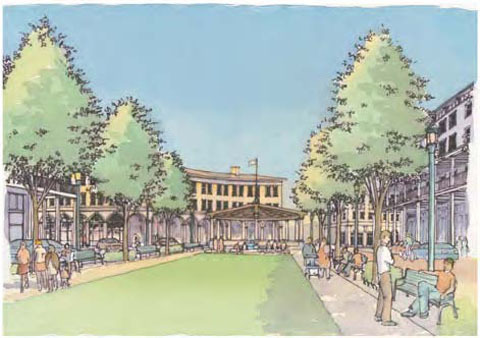 Across the southern end of the green from the artists’ building is another podium building whose crescent-shaped arcade includes a restaurant and other retail spaces(see perspective drawing). 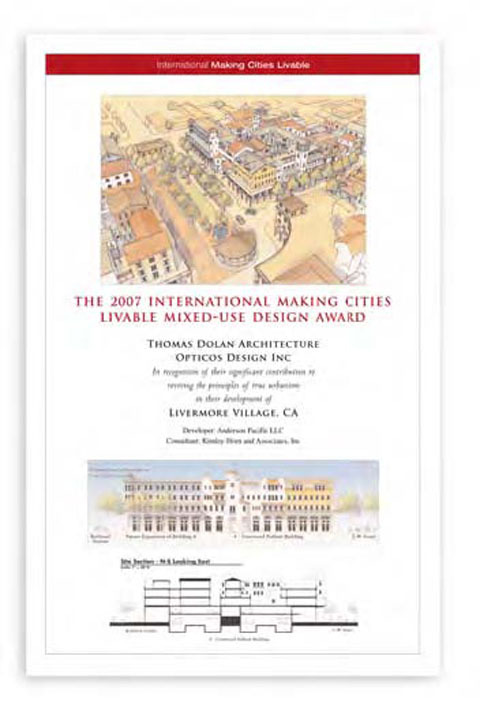 Livermore Village Received the 2007 International Making Cities Livable Award. Livermore Village was envisioned in a downtown plan that identified three contiguous catalyst sites adjacent to Livermore’s newly improved main street. It is a grayfield project, making use of the most central location, a six acre site of a former supermarket. In a city with few buildings over two stories, this public/private partnership was spearheaded by the city’s planning director as the full implementation of a re-invention of Livermore’s downtown. Entitlement of Livermore Village, achieved in an astoundingly short nine month period, was not without its challenges. During the process, some who opposed the project actually evolved into supporters asthey began — through the efforts of the project team — to realize the benefits of this urban infill effort as an important and livable alternate to the suburban sprawl that was rapidly filling the Livermore Valley until the onset of the great recession.